The college-owned house at 143 Wood St. looked lifeless. A salvage company had removed windows and stripped out copper pipes. Spray-painted letters on the sidewalk told of discontinued water and sewer service. In the basement, heating oil had been drained from a tank and sent to Cutten Maintenance Center for reuse in other Bates buildings. But like a cadaver heading to a medical school, the empty building still had something to give. And in this case, the beneficiary was the city of Lewiston. 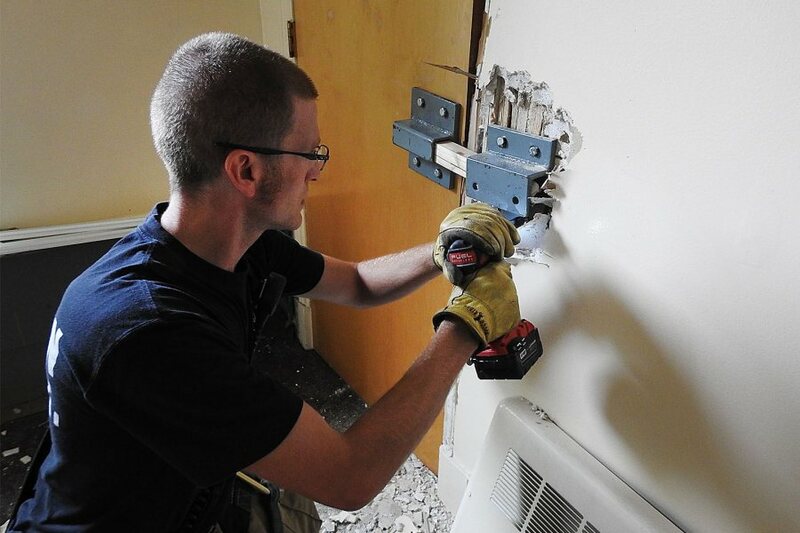 Over three days in July, the gutted former student residence known as Holmes House became the latest Bates building to help Lewiston firefighters do their dangerous jobs safer and faster. Bates provides the majority of buildings for Lewiston’s firefighter training, says Bruce McKay, the city’s acting fire chief. Slated for razing, the structures are used for everything from learning how to remove an injured firefighter from a basement to clearing windows, cutting vent holes in the roof, and breaching a wall if escape through a doorway is blocked by fire or debris. “Bates has been very good to us,” says McKay, and the acting assistant chief, Marc Caron, agrees. “We’re grateful for the opportunity.” That’s because firefighter training sites aren’t easy to come by, especially ones that are just a half-mile from Lewiston’s downtown fire station. Neighboring Auburn has a permanent training building that’s available to area fire departments. But because firefighters train when they’re on duty, “you never want your firefighters too far away from the core of where they need to be,” says McKay. Plus, using a real building is, well, “more real. It affords us opportunities we don’t have,” such as learning to find a fire hidden behind a real wall. Lewiston does use the Auburn facility for live-fire training, since strict regulations make it unrealistic to use donated buildings, such as Bates’, for that purpose — not to mention that burning down a house in a residential neighborhood, producing lots of smoke and ash, would be, shall we say, uncool. McKay’s point person at Bates is environmental health and safety specialist Jim Guzelian. The two talk often, whether about potential buildings for training, using Lake Andrews for practice running the department’s portable pumps, or helping Guzelian with his annual student fire-safety day in the fall, including a live-burn demonstration. “We have a good relationships with the department,” says Guzelian. The buildings that Bates turns over are typically on the periphery of campus, purchased by the college in the 1970s when the college expanded its enrollment by about 400 students, and now obsolete. For example, when Chu Hall and Kalperis Hall opened on Campus Avenue last year, Bates was able to retire three student residences, substandard in terms of their being poorly insulated and inefficient, on Wood Street. Lewiston firefighters practice cutting vent holes in the roof a Holmes House on Wood Street. And in July, Holmes House’s time came to an end. 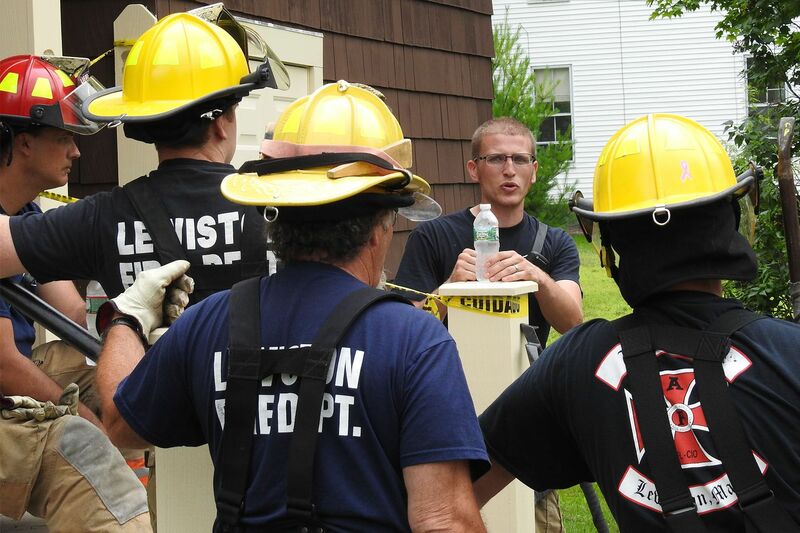 On the morning of July 18, the lesson is about forcible entry, led by 31-year-old Lewiston firefighter Eric Watson. The goal is to “teach skills that you can’t practice until there’s a fire,” and Watson’s implied point is clear: No firefighter should be rehearsing skills during a real fire when human lives, both firefighters’ and civilians’, are at risk. “People don’t realize the potential loss of life from a fire,” he says. Watson arrives well before the dozen or so firefighters scheduled for training that day. He’s got a bag of lag bolts, some 2-by-2s, and several bar holders. Kneeling before a bedroom door, he bolts one bar holder to the edge of the door and one next to it on the wall. He slides a short section of 2-by-2 through the holders, creating a barrier to entry. Watson is ready to teach, but he’s lacking students: The assembled firefighters have left in a blaze of sirens and lights, responding to an alarm a few blocks away. After the false start (caused by a false alarm), the firefighters return and tromp up the stairs to begin their training. Forcing open a door is about having the right tool and the right leverage, but nowhere in sight is that Hollywood standby, the battering ram. “A battering ram isn’t a useful tool because it’s only useful for one purpose,” Watson explains. “Aside from that, it becomes a boat anchor.” Instead, a firefighter’s go-to tool for forcible entry is the Halligan bar, sort of a Swiss Army knife of pry bars with a claw, blade, and tapered pick. 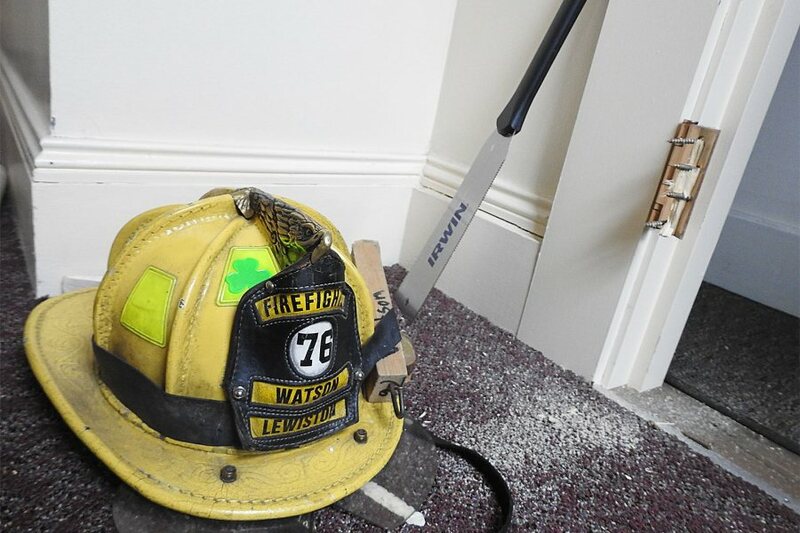 Eric Watson shows the effectiveness of a Halligan bar combined with a roof hook in forcing open a door. Some doors are getting more stubborn, he explains, such as pharmacy doors, which are tougher than ever due to the national increase in forced break-ins by burglars seeking opioid-based narcotics. By midmorning, the sounds of shrieking wood and clanging Halligan bars fill the second floor. Watson offers tips and suggestions as the firefighters struggle with the doors. “When you get the door open and enter, be aware that a victim will often be very close to the door,” he says. Meanwhile, other firefighters have climbed a ladder to the roof, where they practice cutting vent holes using the department’s new Stihl chainsaw, which has a rugged chain for cutting though all the random stuff besides wood, such as shingles and plaster. Over the three July days, about three dozen firefighters — two-thirds of the Lewiston department — improved their skills at 143 Wood St.
Channeling his inner Bill Belichick, McKay says that training is about “knowing your job.” One that, in this case, is about saving lives.